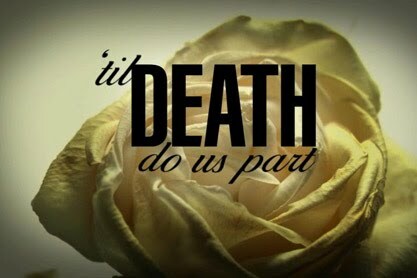 "til death do us part"
No one willingly signs up for uncomfortable situations, painful relationships, or stressful circumstances. Our flesh doesn't want to suffer anything. Our flesh only wants to be pleased, our flesh only wants to be in a pleasant situation, and our flesh only wants pleasing circumstances. For we know that Jesus suffered for us all... if so be that we suffer with him, that we may be also glorified together(Romans 8:17) The vows we vowed unto God on our wedding day are a preview in a sense of what can come up in marriage...in sickness and in health, for richer for poorer, and for better or for worse. For worse seasons will come and to most it is only natural to want to run. The Bible says no weapon that is formed against you shall be able to prosper...so that let's us know that the weapon(s)---for worse seasons---will come and will form, but will not be able to take you out...it's not going to work. The weapon is not designed to be able to work, it's faulty. The enemy has designed so many weapons against marriages, but we know that he is a defeated foe. I declare and decree that there has been a "RECALL" in the name of Jesus on every weapon that the enemy is using to steal, kill and destroy marriages. There has been a RECALL on the "d" word, adultery, drug addiction, alcoholism, verbal-emotional- physical abuse, abandonment, lies, and financial distress...the sufferings of this present time are not worthy to be compared with the glory which SHALL BE revealed in us. Romans 8:18.I'm So Glad God has the FINAL SAY. He is faithful and ABLE to do all Things, continue to trust God. In the Name of Jesus,__________________ family declares for this day that Jesus is Lord of our lives and we believe He is alive from the dead. Therefore, we Are Saved!! Because we’re saved, we’re also redeemed. Christ has redeemed us from the curse of the law by being made a curse for us. We’re redeemed from poverty, sickness, and spiritual death. For poverty, God has given us wealth. So, we declare that all our needs are met; we’re out of debt, and have so much more to put in store. We’ve given and it is given unto us good measure, pressed down, shaken together and running over will men give into our bosoms today. We expect for money to come our way in abundance, because our God promised to pour out a blessing to us that we would not have room to receive. Therefore, ministering angels go forth today and bring to us a return on our seed sown that is ready to be harvested. GLORY BE TO GOD FOREVER!! For sickness, God has given us health. So we declare that our bodies are consistently well from the crown of our heads to the soles of our feet. I Peter 2:24 says, “by whose stripes ye were healed.” Since we were healed, we are healed. Therefore our bodies must line up with the Word of God. Every organ, every fiber, and every tissue of our bodies function in the perfection to which God created them to function. Every disease germ and every virus that touches our bodies die instantly in the Name of Jesus. Our immune systems are strong and healthy, fighting off every foreign invader. To aid in our health, we eat correctly, avoiding those things that knowingly damage the body. And we trust in God’s grace for any mistakes made in ignorance. Unless the rapture happens first, we will live to be at least 120 years of age, free from sickness and disease. For God said, “with long life will I satisfy you and show you my salvation.” GLORY BE TO GOD FOREVER!! For spiritual death, God has given us eternal life. We will never be separated from God. When we leave our bodies, we will be immediately with God. For to be absent from the body is to be present with the Lord. We are His. He is ours. We are one together. He has given us joy unspeakable and full of glory. So, we refuse to be depressed or discouraged about anything. He has given us peace that passes all understanding. So, we refuse to worry or be concerned about anything. We simply roll the care on God. We do our best and then rest. He has crowned us with favor for this day. So, we declare that we’re favored by God. We have favor with God and man. People do great things for us daily. Everywhere that we go, favor goes before us; follows us; and surrounds us. My family walks in the blessings of God. No weapon formed against us will prosper this day. The blood of Jesus is upon us and upon our possessions for covenant protection this day. The angels of God are encamped round about us to see to it that no harm or danger will come near us in any way. We are blessed in the city and blessed in the field. Blessed in the basket and blessed in the store. Blessed coming in and blessed going out. We are the head and not the tail. Above ONLY and NEVER beneath. We love and serve the Lord with all of our mind, heart and soul and nothing shall separate us from His love. This is a good day!! One that we’ve never seen before. One that we’ll never see again. So we’ll give God, my family, and my ministry my BEST today. God’s first, but our family unit is next in priority. We are a tight knit unit - strong and united. We enjoy spending time together. Each member of our family is valuable and we appreciate how God uniquely designed us. We celebrate our achievements and stand by one another in times of adversity. We covenant to love unconditionally and serve each other faithfully. We are kind and respectful, giving preference to one another. We always speak the truth in love, while being open to listen to what others have to say. There is nothing that we can’t share, because we cultivate an environment of intimacy and openness. We face all challenges together with God knowing that the blessing that’s on our family always causes us to triumph in Christ Jesus. GLORY BE TO GOD FOREVER! !